More than just a walk. Thru-hiking the length of the Heysen Trail was undoubtedly my most demanding physical and mental challenge. However, this isolated two-month battle is nothing compared to the struggles that people with mental health issues go through every day. Knowing this, it was with enormous pride that I fundraised for the Black Dog Institute while on the trail. 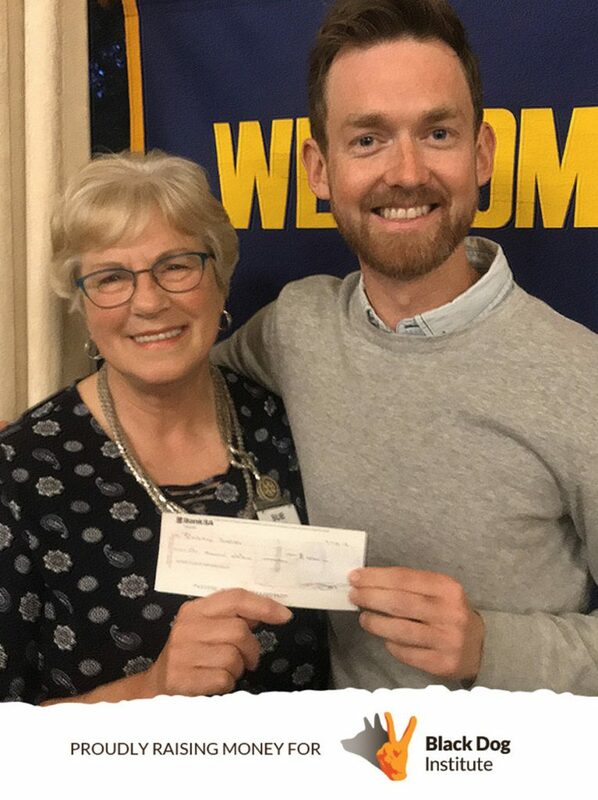 Thanks to the Barossa Valley Rotary Club, my team of helpers at the Barossa Community Walk and all of the sponsors who donated prizes, we raised substantial funds to help supplement the generosity of those who donated directly to the cause. 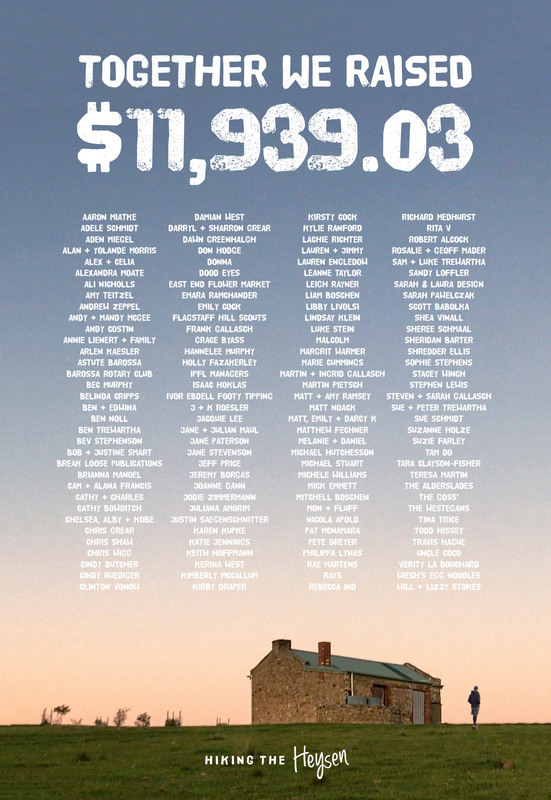 Collectively, we compiled an astonishing $11,939.03 to help treat mental illnesses across Australia. On Day 42, I challenged South Australia’s budding community of long-distance hikers to join me on my way into the stunning Barossa Valley. 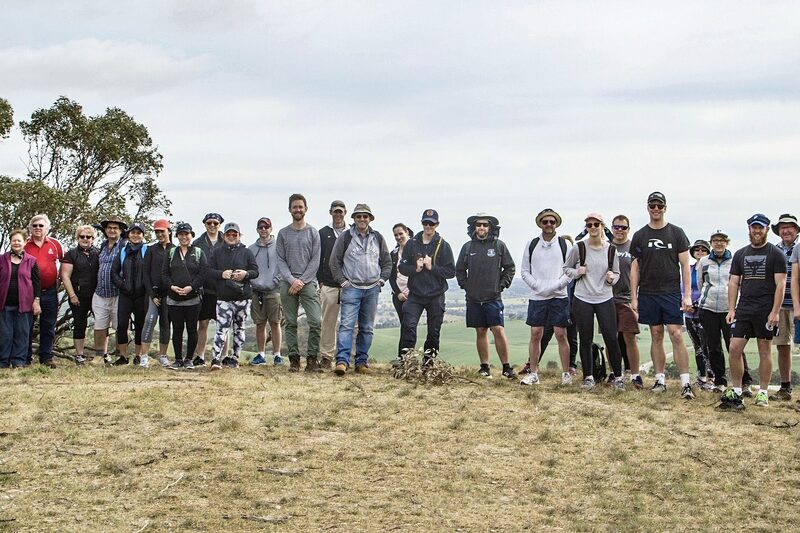 The journey of 19.7 kilometres (approximately one-sixtieth of the Heysen Trail) saw 25 walkers descend from the hills of Greenock into the town of Tanunda. The days’ itinerary included a cooked breakfast, with eggs supplied by Falkai farms, overlooking the surrounding pastoral district, lunch supplied by Wiech’s Barossa Valley Egg Noodles at Whistler Wines and a victory beer at the Valley Hotel in Tanunda. Thanks to the support of everybody on the day and in particular my amazingly supportive parents, we raised $880.48 for the charity. The Barossa Valley Rotary Club made an incredible contribution to the cause. This organisation serves the Barossa Community, South Australia, Australia and the rest of the world. Rotary is an International organisation of people willing to help others wherever they can, and they certainly made a significant impact on my fundraising endeavours for the Black Dog Institute. Through rain-soaked volunteer-led BBQs, their efforts added an amazing $1,040 for the cause. 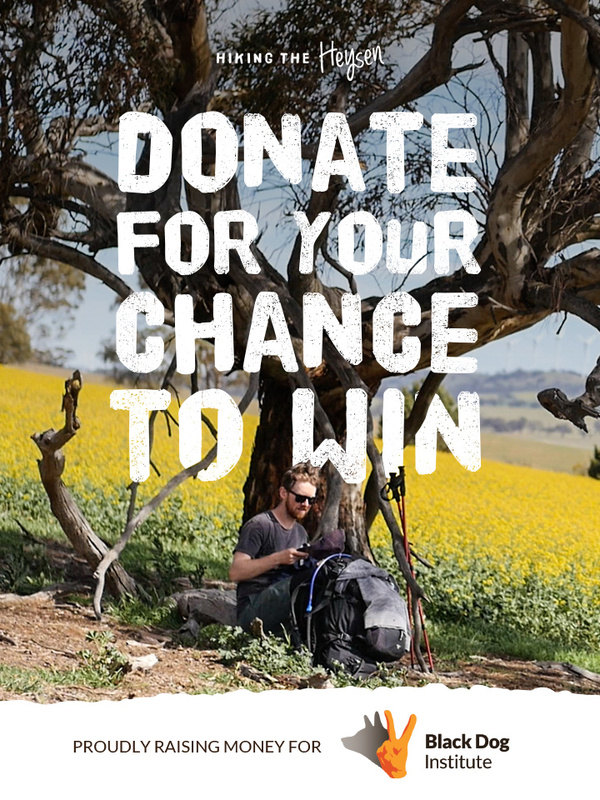 In the final few weeks of the trail, I launched two prize giveaways for everybody who donated to the cause. The South Australian Product Pack contained bottles from Whistler Wines, packets of Wiech’s Barossa Valley Egg Noodles, cheese from Paris Creek Farms and a family pack of Menz FruChocs. The South Australian Experiences Pack included a wine tour for two from Shiraz & Co and a family ticket for Adelaide’s iconic Popeye. Thanks to the generous donations from sponsors, we were able to surpass $10,000 raised by the time I completed the trail. Less than half of all Australians experiencing the symptoms of mental illness will seek professional help, and it is quite often distance and a lack of face-to-face services that contribute to these startling numbers. In very remote areas, psychiatrists are around six times less prevalent than in cities, while mental health-related hospitalisations and suicides (up to 93% higher) are more frequent in rural regions. One small thing we can all do is get back to nature. Nature walks are linked with significantly lower depression, less stress and enhanced mental health and wellbeing; highlighting the importance of hiking and outdoor activities. 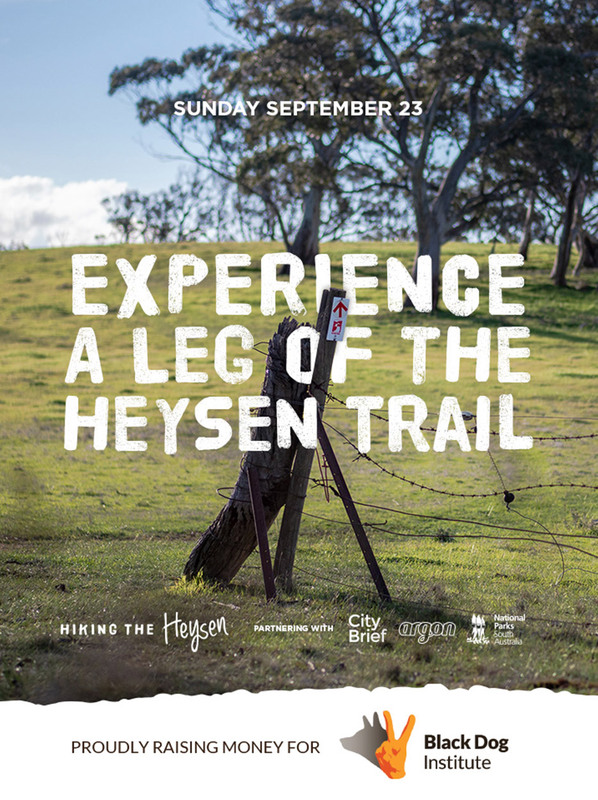 Day hikes along sections of the Heysen Trail, or anywhere throughout South Australia’s nature reserves, are a fantastic way to reset the mind and reinvigorate the soul. Another thing we can do is support organisations that solve mental health problems and promote wellbeing. The Black Dog Institute are pioneers in the diagnosis, early intervention, prevention and treatment of mental illnesses such as depression, anxiety, bipolar disorder and they are at the forefront of suicide prevention.